We can’t boolieve (yes, we went there) that Halloween is only one week away! We’re getting ready to throw our sweetest party yet, and we want YOU to join in on the fun. We’re pretty good (okay, we’re experts) at celebrating special occasions, so we’ve created a step-by-step guide for getting in the Halloween spirit and throwing a spooktacular party! One of our favorite traditions is carving jack-o-lanterns because it’s a great way to get into the spirit of Halloween AND you get to eat the seeds after! From scary faces to festive shapes, there are so many designs to choose from. If you’re looking for some out-of-the-box inspiration, show off your favorite fruit by carving jack-o-lanterns with our festive fruit pumpkin carving stencils. And, if you want to take it up a notch, try carving ghoulish faces and shapes into pineapples! Whether you’re aiming for a spooky fright night or a wicked and wacky wonderland, decorating for Halloween is the perfect way to set the stage for a sweet celebration! Take your party setting to the next level by decorating the walls with fake spider webs and using silverware and dishes in festive colors like purple, orange, green, and black. For an extra spooky touch, turn off the lights and scatter black lights and fog machines throughout the room – the floor will look like it disappeared and everything around you will glow! Step 4: Offer Treats without the Tricks! Keep the party going with festive treats that’ll satisfy everyone’s sweet tooth (or fang)! 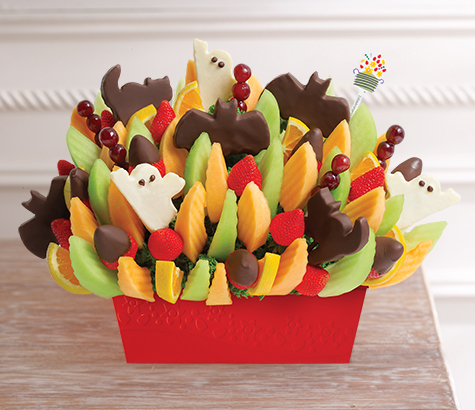 With gourmet chocolate dipped pineapple bats, cats, and ghosts, our Bootastic Festival™ would be a WOW-worthy centerpiece at your Halloween party dessert table! If you’re gifting favors, offer each of your guests a box of chocolate dipped strawberries with festive orange and green Swizzle® – a treat they’ll enjoy long after your party. For Halloween celebrations in the classroom, hand out pineapple Edible® Pops to each student as a sweet and fresh way to enjoy the holiday! No matter what you do to celebrate, we hope this Halloween is your sweetest one yet! If you follow any of our steps while planning your party, don’t forget to tag us in photos of your spooktacular bash on Instagram @ediblearrangements or tweet us at @edible using #EdibleHalloween!